So often a song comes along and it seems to be about a love relationship or the breaking up of, but actually it’s nothing of the sort. One such example is Ace’s only UK hit, How Long which actually tells the story of how the lead singer Paul Carrack caught the bass player Terry Comer working with other bands thus cheating on Paul and him finding out. 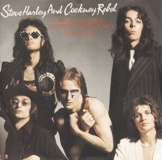 Another such song is Steve Harley and Cockney Rebel’s 1975 chart-topper Make Me Smile (Come Up And See Me). Nothing to do with love nor Mae West, but actually about Steve Harley’s anger of the band walking out on him. Steve Harley was born Stephen Nice in Deptford, south London in 1951. A little known fact was that as a kid he suffered from polio. At the ages of 12 and 15 he had two major operations and spent numerous weeks in hospital. To pass the time he would read and came to know the works of poets like D.H. Lawrence, T.S. Eliot, John Steinbeck and Ernest Hemingway. Musically he began listening to Bob Dylan and that is when he decided on a career in music. After leaving school at 17, his first job was with the Daily Express as a trainee accountant, he progressed to reporter and later moved on to work with various newspapers in the Essex area. He began playing folk clubs in the early seventies alongside singers like Ralph McTell and John Martyn. At one point he ‘progressed’ to busking on the London Underground and at the Portobello Road market and in late 1972 formed his own band, the Cockney Rebel. In an interview with Uncut magazine, Steve said, “The song was originally written as a slow blues, but the producer, Alan Parsons, suggested speeding it up. It was a little dirgy, slower and a little pedestrian, very on the beat. I changed it to a way I thought worked much better with the girls. The first verse, ‘you’ve done it all, you’ve broken every code/and pulled the rebel to the floor’ was probably written at four in the morning after a bottle of brandy, feeling sorry for myself.” In the song Steve accuses them of selling out and sings ‘you spoilt the game, no matter what you say, for only metal – what a bore!’ On one occasion when he performed the song on Top of the Pops, although the instrumental backing was mimed, Harley performed a live vocal and promptly forgot most of the second and third verses. The acoustic, flamenco-styled guitar solo between the second and third verse was originally part of the soundcheck warm-up which was captured on tape and later used when it was decided that it added to the song. Harley’s new Cockney Rebel retained Stuart Elliott on drums and recruited Jim Cregan from Family on guitar, George Ford from Medicine Head on bass and Duncan Mackay on keyboards. They made the hit album, The Best Years of Our Lives, which also included the hit single Mr. Raffles (Man It Was Mean). Two of the original members of Cockney Rebel, keyboard player Milton Reame James and bassist Paul Jeffries played briefly in Bill Nelson’s Be Bop Deluxe before forming their own band, Chartreuse. Bill Nelson recalls that Paul’s great passion in life was not music but tree preservation. In 1988, Paul died in the terrorist explosion on a Pan Am flight over Lockerbie in Scotland.